Tips for Protecting Your Intellectual Property | Wilson Auction & Realty Co, Ltd.
Did you know that intellectual property can be auctioned off to the highest bidder? More on that later… First things first: what is intellectual property, anyway? Intellectual property refers to creations of the mind, such as inventions, literary and artistic works, designs, and symbols, names and images used in commerce. For instance, say your family owned a business called Joe’s Mediterranean Deli. If this business had a logo to identify it, that would be an example of intellectual property. Now say Joe passed away and no one in the family wanted to take over the deli. It is conceivable that the still-living family members could put up the Joe’s Mediterranean Deli logo at auction with the hopes someone else might like to own it and other associated intellectual property. Maybe someone else in town really wants to start a new version of the deli, but would like previous customers to check his or her place out because it retains some of what they remembered from the old place. Intellectual property is protected by law such that the creators of it can benefit financially. If you’ve ever heard of the terms copyright, trademark and/or patent, these all have to do with intellectual property. 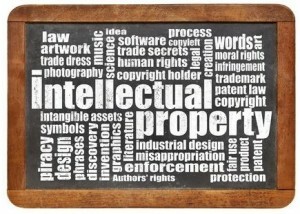 What are some tips for protecting intellectual property? You can check to see that yours is an original idea, and, if so, patent or trademark it through the government. Specifically, the U.S. Patent and Trademark Office is set up for this at https://www.uspto.gov/. When dealing with employees and consultants, have them sign contracts that explicitly state you own certain intellectual property and they… don’t. Keep great records of when and what you develop. For example, date and sign copies of any drawings or drafts you make. If and when you decide to “sell” your intellectual property, consider aligning with Wilson Auction & Realty to put your intellectual property up for auction. It’s one of the few companies in the country specializing in this sort of thing. Interestingly, many people don’t understand the real value of intellectual property. They may miss out on a lot of money by ignoring the fact that intellectual property has tremendous value. You’d be surprised at how much a patent or trademarked concept can fetch at auction. When marketed to the right audience– one that’s interested in what’s being sold– the sky’s the limit for bids. Furthermore, thanks to technology, intellectual property auctions can be global today, rather than localized. Wilson Auction can facilitate such auctions and help you figure out the value of your unique assets. Please call 866-870-5500 or 419-636-5500 to discuss intellectual property auctions today.